Have you tailored your screen layout specifically for your staff and jobs? Or are you still using the ‘off-the-shelf’ layout? Modern browsers are getting smarter (or scarier) and can remember the information you have put into forms on websites and this is not just AbtracOnline but any form you fill out. Sometimes this information will be automatically put into AbtracOnline if the browser thinks that it’s saving you time by adding the information for you. When you Go Live with AbtracOnLine you’ll be sent an email confirming your site is live, and letting you know your login details. Once you’ve logged into Abtrac you’ll need to go to the subscriptions page and enter your payment details to activate your site. Part of this activation includes a digital confirmation that you have read and accepted our terms and conditions of use. Once we receive your credit card details your monthly subscription will then be activated and will continue for as long as appropriate and timely payments are being made. Read on for instructions on how to activate your site. From September 1st 2017 we are changing the way we manage adjustments to your Abtrac subscription. We’re moving to a more automated licensing system, leaving you in control of your licensed employees and your monthly licence fees. When you make a change to your employees (or add-on modules) you’ll now be asked to confirm this change – and acknowledge any resultant change to your subscription fees. Read on for more details on what’s involved in the new system, and how it may affect your current AbtracOnLine subscription. From Friday Aug 25th, 2017 there will be an update to Abtrac involving a noticeable change to the home page. We have introduced a small number of dashboard items as “widgets” which you can control for each user group in your office. This is in response to several requests for more dashboard-like features. Read on for a discussion of each of the new Home page widgets, and details on how to control them from Administration > Employees > User groups and Privileges. Throughout Australasia it is a requirement where the work is part of a construction claim to include a reference to the claim or to the specific payment terms of your invoices. In NZ the legislation includes the Construction Contracts act, and in Australia there are the various Security of payments acts which govern progress claims. You can upload a default document from the Administration pages within Abtrac to ensure these payment claim terms attach to every invoice sent from AbtracOnLine. Employee Charge Rates in AbtracOnLine can be as simple or as flexible as required. This article explains how to set up default charge rates, multiple rates for employees and how to hide rate details from timesheet users. In AbtracOnLine you can email invoices directly, without the need for email software. Abtrac integrates easily with all popular desktop & cloud accounting software packages. 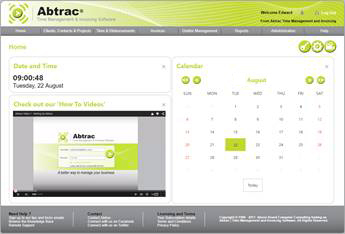 At the click of a button, upload your contacts, sales invoices and other information from Abtrac to all these packages and others. Double entry is a thing of the past now that data between our systems connects and synchronises so elegantly. And managing two systems which work together as one has never been easier. Employee Charge Rates in Abtrac can be as simple or as flexible as required. Here’s how to ensure you have the right charge rates in the right location for your billing requirements. There’s a bit of a hierarchy as to which rate is applied when, read on for details. The forms and documents that are sent to your clients from AbtracOnLine can all be styled to suit your corporate image. The invoice layout is the most commonly modified form, if applicable you can also customise your Purchase Orders and Accounts Rendered. This article details modifications to the invoice layout, but the process is similar for all other instances. Tasks or Activities, Which should I use? 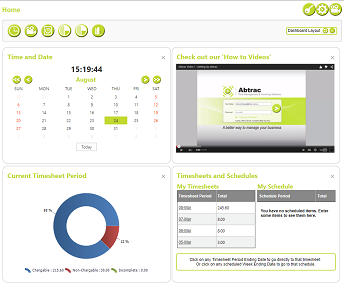 One Frequently asked question from new Abtrac users is whether to use Tasks or Activities in their timesheets. Here’s the difference between the two: Tasks are Quantitative, Activities are not. Tasks are where you enter the budget for the job. Tasks are also sometimes called Stages or Phases. They should be exactly the same as budget items on the fee agreement you document to the client. You give each task an estimate of both time and fees, and then analyse them later using reports such as Actual vs Budget by Task, or Invoice Preparation Information Report. These reports compare your proposed amounts, time spent, and amount invoiced. You can learn from them over time to see how good staff are in getting through work allotted to them as well as how good you are in your estimates. If necessary you can modify your thinking and estimating to more correctly budget the next job based on what you’ve learnt from previous jobs. If Tasks are the bits of the job you’re working on, Activities are what you’re doing on each bit. Really activities are to save you typing the same comments over and over again. There are limited reports based on activities other than those used when reviewing timesheet entries and preparing descriptions for invoice lines. Activities are generic across all jobs whereas tasks and the values associated with them are very much specific to a particular job, especially when there are variations and extras on a job by job basis. From System Management in Abtrac your business details can include information for multiple branches/offices. These Offices or Branches can also be applied to each employee, job or project and carried through to invoicing and analysis. You can then run reports by office – comparing performance and profitability between branches and managing workflow. It’s also useful when you have one tax entity but different physical addresses, and different invoicing and accounting requirements between locations. There’s also an option to limit access for Abtrac users by office, enabling them to only view and edit offices to which they have been assigned. When using multiple offices in Abtrac there are a few things to bear in mind. It’s possible to limit access for Abtrac users by office, enabling them to only view and edit offices to which they have been assigned. We recommend that if you are interested in using this feature that you satisfy yourself that all relevant data in Abtrac has an office assigned. If you’ve been using multiple offices for some time this shouldn’t be an issue, but if you are new to multiple offices or otherwise wary of data inaccuracies then the Abtrac support team are available for consulting and if required to run scripts against your data to ensure accuracy and a smooth transition. The process is slightly difference for each version of Abtrac. AbtracOnLine allows users to generate invoices and email them directly to their clients. This month we’re releasing a change to AbtracOnLine which lets you choose the method by which your emails are sent. Why are we making this change? It’s important to us that your invoice management and delivery with AbtracOnLine remains reliable, even as the global email environment changes. Mail Servers and email ISPs now have more rigid practices to try and shield their users from spam, and we need to adapt Abtrac to ensure your mail isn’t incorrectly bounced or blocked. All of our support articles are here in chronological order. If you are looking for something specific you can search for it above, or browse all our articles by categories from the list below. If you can't find it here then you can always contact the Abtrac Support team. We'd be happy to help you get the answers you need. We answer frequently asked support questions, and give you our tips on how to get the most from Abtrac. If required we can log into your machine and work with you to solve support queries. For hands on help we use TeamViewer with our remote support sessions. Follow this link to learn more about our remote support app.